Beatle Spawn Dhani Harrison Forges an Electronic Path on Solo Debut LP . Beatles Radio: The Beatles, Solos, Covers, Birthdays, News The Fab 4 and More! The best advice George Harrison gave his son was "Keep your head down. There's enough trouble that will find you without having to go looking for it," the 39-year-old multi-instrumentalist and film composer says in a phone interview. 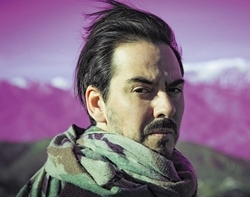 Dhani Harrison has inherited his dad's predilection for operating quietly and deflecting attention—as much as a musician in earth's most popular rock band could do so. Notably, Harrison the younger is not trying to follow in the footsteps of his world-famous father. That would be a fool's errand, as Julian Lennon could tell you. Instead, Harrison is forging a distinctly 21st-century path toward a rewarding middle ground between electronic music and rock.